The clip is only 47 seconds long, but it means a hell of a lot. I've transcribed the entire thing below, and Video and an MP3 file is also available. I'll be posting more about the details of this tonight and all day tomorrow, along with an article that puts everything together in one cohesive post. I'm doing this for everyone, of course, but I'm also doing it to make it easier for press folks in the mainstream media to cover these developments over this upcoming, critical week. 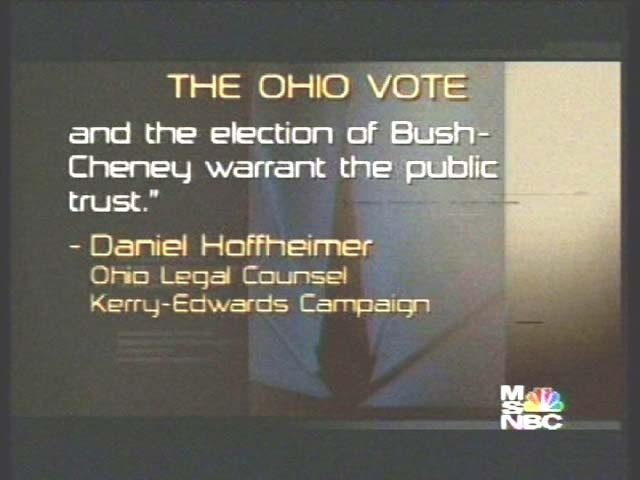 The Ohio Recount has been totally invalidated due to a combination of factors, most notably the obvious and incontestable recount machine tampering by a Triad employee. The Kerry-Edwards campaign is filing papers tomorrow to impound all of the recount equipment in question until the entire matter can be investigated in a timely manner. Representative John Conyers (D-MI) and others are planning to challenge the election on January 6th, and they say that, this time around, unlike in 2000, they can get the support of one or more Senators to make the Challenge hold. Here's the Video (2 MB) and MP3 (1 MB) of the Countdown story quoting Kerry's attorney. 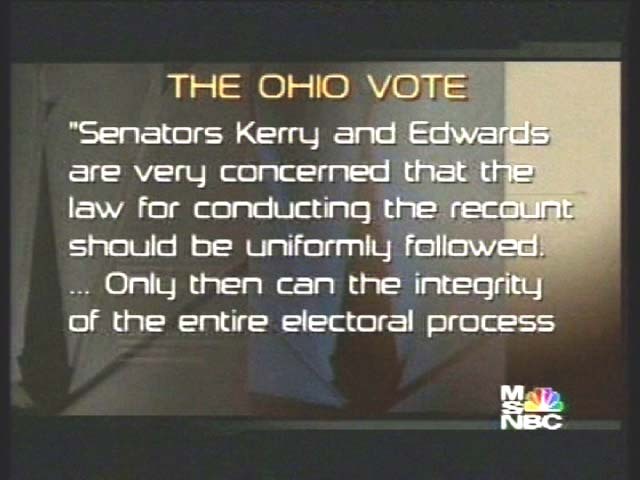 And although the race for president really is all but over tonight, in the state of Ohio, Senator John Kerry's legal team is filing papers in Federal Court, asking in effect that all of the evidence obtained during the recount be saved, and that the court move quickly to uncover the facts. 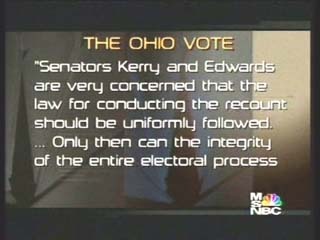 "Senators Kerry and Edwards and very concerned that the law for conducting the recount should be uniformly followed. 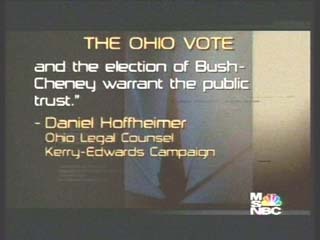 Only then can the integrity of the entire electoral process and the election of Bush-Cheney warrant the public trust." Wow! That's great. Thanks for keeping an eye on this stuff for us Lisa.